Rashtrapati Bhavan , the official residence of the President of India has an area of 354 acres excluding the buildings and roads. The area under trees, lawns and open areas is about 320 acres, which includes 6 hectares of the famous Mughal Gardens attached to the main building of the Rashtrapati Bhavan. Sir Edwin Lutyens did the designing of the building and the gardens. Lutyens original thought was to lay down two separate gardens one for the Viceroy and other for the public but he took up the idea of designing the Mughal Gardens for Lady Harding. After carefully studying the Persian and Indian miniatures as well as the gardens at Taj Mahal and Shalimar Gardens at Lahore and Srinagar, Lutyens combined the formal Mughal style with the design of a British Garden. These gardens are a beautiful blend of Mughal canals and terraces at different levels and flowering shrubs fuse with the European flowerbeds, lawns and privet hedges. W. R. Mustoe, O.B.E of the Horticultural Department was responsible for all the planting made in the gardens in the initial years. With his help Lutyens was able to transform a desert into an oasis by 1929, when the building was ready for occupation. The Gardens comprise of three parts: the first is the Rectangular Garden immediately behind the main building. The second is the Long Garden, which leads on to the third section, the Circular Garden. The Rectangular Garden is a formal garden, which derived its treatment from the water-gardens, a concept brought by the Mughals into Delhi. Lutyens combined the softening of English borders, small flowerbeds and mown lawns to produce a virtual paradise. The skeleton is formed of four waterways, two north to south, two running from square basins immediately below the windows of the Main house. In these basins and at the four intersections are the unique fountains consisting of 3-tiers of huge red-sandstone discs that draw inspiration from lotus leaves. The slotted margins of the leaves direct the flow from step to step in alternating falls. From the 4 waterways a network of lesser channels extend to other areas. The waterways are patterned with red-sandstone edges and plots of lawn alternating with chequered flowerbeds creating a wonderfully landscaped garden. The garden spread westwards from the Rectangular Garden to the Circular Garden through the Long Garden, which is the only part of the garden with no water channels. Over here, Lutyens has designed a delightful Pergola, on which bougainvillea creepers are grown. On the sides it has separate beds of roses with small trimmed hedge of Ingadulets, giving effect of the coloured knots on a vast carpet. The gardens end quite simply in the round pool in the middle of a sunken circle. Around the pool are massed segmental and tiered flowerbeds presenting a feast for the butterflies. 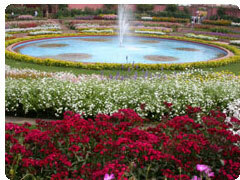 This part is the Circular Garden also called the Pearl Garden and Butterfly Garden. The gardens contain several varieties of rose, viscaria, teptosyne, sweet william, oxalis, marigold, bougainvillea and several other annuals and perinnials. The Mughal Gardens has got probably the largest range of rose varieties at one place, more than 250 and these include the Benkinsian, believed to be the parent of all strains. The garden also grows 60 of the 101 known kinds of boigainvillea. Gardens contain the best and largest collection of Indian marigold flowers. 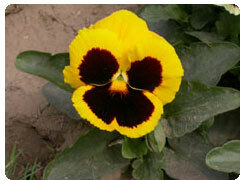 There are also 13 different varieties of the flower, the size of which varies from a diameter of 2cms to 10cms. The Dahlias are another great attraction. When in full bloom, the dahlia varies in sizes of six inches to twelve inches and the shades of pink, mauve, golden rust, red, white, yellow present a sight for sore eyes. The red and white striped dahlias, which look like peppermint, are also worthy of mention. The Moulsari trees in the Mughal Gardens are very special. Lutyens chose these for the rectangular garden because of their Indian origin and to find a mention in ancient Indian literature. These carefully shaped trees not only give weight, form and shade in the gardens, but their placement is a vital element in relating the garden to scale. The bonsai collection of the Rashtrapati Bhavan is also considered to be one of the finest in the country. 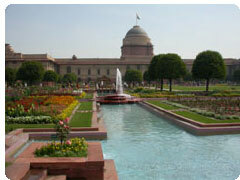 The Mughal gardens are open to the public in February-March every year. Visitors are allowed entry to the garden from 9:30 A.M. till 4:00 P.M. on all days except Mondays. The gardens may remain closed on other days also in case of a function in the Mughal gardens or during the visit of a VVIP during the said period. 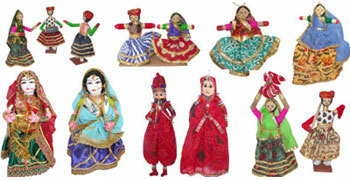 The dates are made known to the public through various media. The entry and exit into the gardens is regulated from Gate No. 35 of the President's Estate, which is located near the North Avenue, at the western end of the Church Road.